There is something about being accountable not just to myself, but also to everyone "out there" that pushes me to get things done. And there is certain sense of accomplishment and pride when I can in turn show you all the progress I have made and maybe inspire you all to take a little action as well. This Spring De-Junk Challenge I am taking part in for the next 10 days is just one of those kick in the pants kinds of things that I need right about now. You all know we have those places in our homes- that cluttered kitchen cabinet, that bedroom closet that is packed full of clothes that haven't been worn by anything other than a hanger for the past year or so, that crazy drawer in the kitchen or bathroom that you sort of cringe at every time you have to open it. I know you all know exactly what I am talking about, right? For the next 10 days (you can take Sunday off), do one thing every day to make some progress toward de-junking or spring cleaning your home. Pick a spot in your home that you need to clean or de-junk. (For some, this may be one drawer. For others, it might be the entire garage. Do what works for you. Baby steps, right? Take a before photo, and share it on Instagram with the hashtag #SpringDeJunkChallenge. At the end of the day, take another photo and show everyone your progress. The purpose of taking pictures and posting them is to make the challenge more fun and to inspire other people to join us. Everything is more fun with a friend, right? If taking and posting pictures will keep you from completing the challenge -- skip it! So, are you up for the challenge? Follow your hosts on Instagram (links are in the Rafflecopter for the giveaway) to see how we're all completing the challenge and to get some ideas! 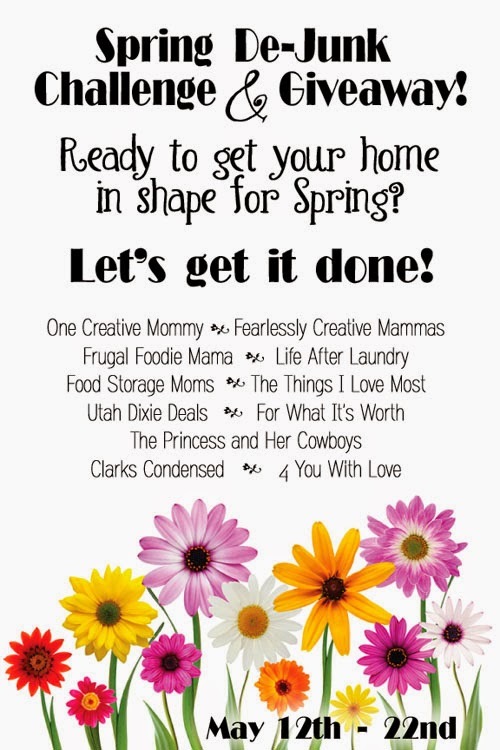 To add to the fun, this Friday, all 11 participating bloggers will share a special post about getting their home in shape for Spring. Don't forget to check back on Friday to get some inspiration for your own home. What challenge would be complete without a prize? For most of us, the prize will be a clean and organized home. But, for one lucky de-junker, the prize will be a little bigger! How about a little something to improve your home? Maybe $110 to spend at Lowe's?!!! Sounds good, right? So enter away! Good luck with the challenge! Want to visit the bloggers sponsoring the series and see some of the great things on their blogs? We all love new visitors, and we'd love to hear from you!